Anthony Cardenales was only seventeen when he went to prison. Seventeen years later, when he went home to the Bronx, he quickly found a job at a recycling company in Westchester. A few years later, he had become its manager. How did Anthony defy the more common fate of returning to prison within three to five years after release? The answer is simple: he went to college in prison, earning both an Associate’s and a Bachelor’s degree, in the process developing the discipline and self-confidence that has enabled him to become a savvy and successful professional. 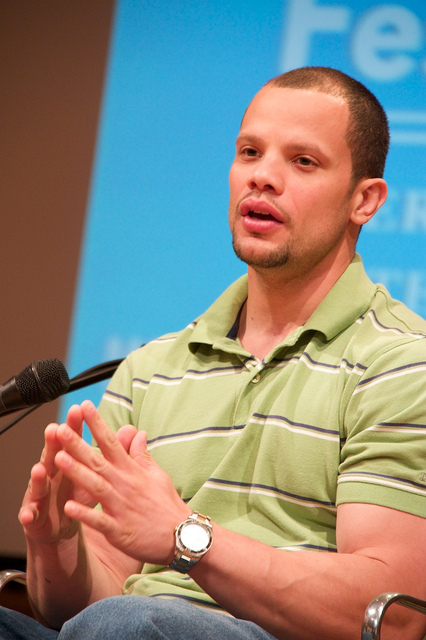 Anthony Cardenales speaks on a panel at PEN America. Photo courtesy of PEN America. Anthony is a graduate of Bard College, which has awarded 485 degrees in New York State prisons over the last decade through the Bard Prison Initiative (BPI). The roughly 2.2 million men and women now languishing in American prisons are among the least educated people in the country. Students entering BPI have weak language and mathematical skills, and many did not complete high school before their convictions. Despite that, their motivation, combined with the faculty’s belief in their ability and commitment to determined, excellent teaching, quickly enables them to rise up to college levels of academic performance. The approximately 300 students enrolled in BPI must meet rigorous distribution requirements, designed to ensure that all students are exposed to different disciplines and fields of study. They choose from among the 165 liberal arts courses offered every year, in subjects ranging from advanced mathematics and genetics, to Mongol history, romantic poetry, and introduction to ethnography, as well as in more vocationally oriented classes in public health, computer science, and teaching. Approximately seventy men and women who have been BPI students return home every year, many continuing their education and almost all (85%) securing jobs within two months of their release. While 97% of BPI graduates leave prison and never come back. BPI students at Eastern Correctional Facility. Photo courtesy of Bard Prison Initiative. Bard’s prison program was started by Max Kenner, when he was an undergraduate at Bard. Beginning with one workshop in one prison, BPI has spread to six New York state prisons and now offers both Associate’s and Bachelor’s degrees. It also anchors a consortium of similar programs at twelve other colleges and universities across the U.S., including Wesleyan in Connecticut, the University of Notre Dame in Illinois, and Washington University in St. Louis. Until 2015, students enrolled in college in prison were ineligible for Pell Grants or other kinds of financial assistance, but this has been changing in recent years, making it likely that more colleges will open campuses behind bars. Max Kenner in the Woodbourne Correctional Facility. Photo courtesy of Stefan Falke. As that happens, more formerly incarcerated men and women—97% of whom will someday be released—will be able to find employment. This will help them contribute to the support of their families, thereby serving to interrupt the intergenerational cycles of imprisonment that accompany mass incarceration. Lowering rates of return to prison will lower the costs of corrections and free up scarce resources for other urgent needs such as health and education. With strong evidence that college programs reduce violence in prisons, the further spread of college offerings is also likely to improve life inside. It is for this reason so many prison superintendents favor college programs. The improved atmosphere college programs help to create benefits both people in custody and correctional officers. 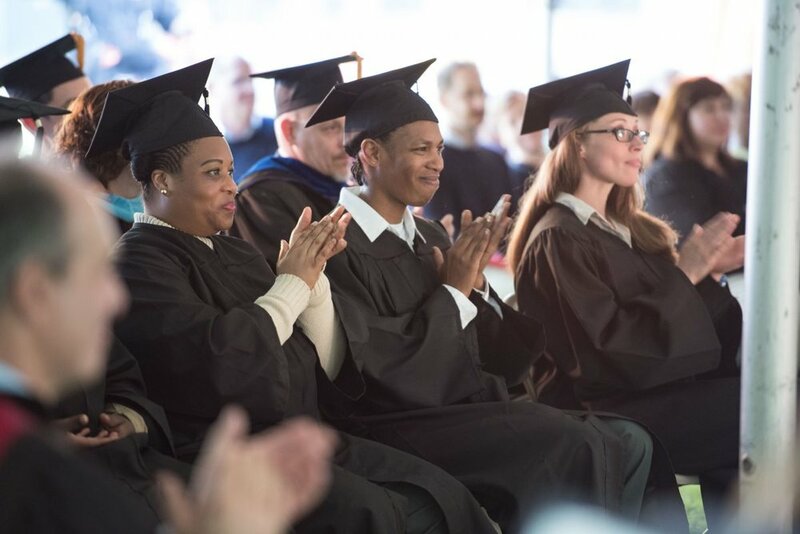 Graduating BPI students at a commencement ceremony at Taconic Correctional Facility. Photo courtesy of The Chicago Ambassador. California, which has long led the nation in providing access to high quality postsecondary education, now has a degree-granting college program associated with each of its state prisons. Some of these programs are focused on the liberal arts. Others are more vocational in their curriculum. To ensure high quality, all are defined by the policies and practices of the affiliated colleges and must offer the curriculum and adhere to the standards in place at the college’s home campus. California’s extension of its higher education system to encompass all its prisons can and should be a model for other states to copy. When that happens, prisons will finally warrant the title “rehabilitation institution” transforming them into beacons of educational opportunity. Ellen Condliffe Lagemann is the author of Liberating Minds: The Case for College in Prison (The New Press, 2016). She is the Levy Institute Research Professor at Bard College and a Distinguished Fellow at the Bard Prison Initiative.